Ever since I could try out active antennas, I have become a great fan of them. Well, some of them. For VHF/UHF I used to use a Diamond D-707 omni-directional antenna. It is specified to work from 500kHz to 1500MHz. To be honest - for long, medium and shortwave I have something better, but for VHF/UHF this antenna is excellent when you have little space and want to cover as much as you can with one antenna. The amp is said to have 20dB gain, the gain is adjustable by means of a supply voltage regulator. That was a pity because Diamond has stopped production of this antenna somewhen in the year 200x, for unknown reasons. I did not throw away my antennas (I had two of them), with the idea of repairing them somewhen. Somewhen is now, 2015. The D-707 am in it's brass tube, PL socket to the left, antenna to the right. The silver antenna part can be unscrewed from the amp. The challenge was to open the brass tube. Impatient as I am i used a small Proxon tool to cut the brass tube open, because neither the PL socket at the lower end, nor the plastic cap at the other end turned, even when applying some considerable force. So here is how the amp looks at the inside. The PL socket is to the right, the plastic cap to the left. The components on the PCB are protected by some rubbery glue, perhaps to protect them against humidity inside the antenna. I was able to remove most of that glue with mechanical tools, perhaps some chemistry would have done a faster and better job (Acetone?). To find out what's wrong with the antenna, I needed a schematic and information about the components. So I took some time and traced the components, and here is the schematic of the amplifier. It is a quite simple two stage amp with low-noise 2SC4226 transistors. They are made by Renesas and other manufacturers and are specified up to 1GHz, but are usable somwhat above that frequency with an acceptable noise figure. I used KiCad for drawing the schematic. And here is a somewhat larger view of the PCB. Of course all components except the the inductors are SMD. I did not bother to make measurements of what might actually be broken - I simply assumed that one or both transistors were defective and needed to be exchanged. So I ordered some 2SC4226 from an online store in Israel and received them a few days later. The shipping cost were higher than the product cost. Since my eyes aren't good enough anymore, and my hands not steady enough, I asked my colleague Daniel to swap the transistors. He did that, and that put the antenna back in perfect function. Many thanks, Daniel! He also found out how to open the brass tube which encloses the transistor without brute force methods. Both, the plastic cap and the PL socket are glued into the brass tube thread and can be removed by heating the brass tube carefully. 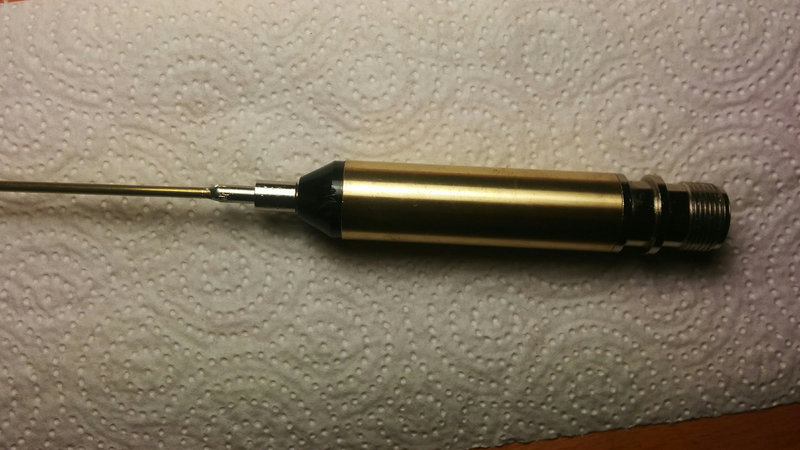 First unscrew the antenna from thin brass thread which protudes on top of the black plastic thingie. This reveals a solder center in the brass part. Heat carefully and remove all solder with a desoldering pump or desoldering braid made for that purpose. Be careful not to overheat the small brass part, it will melt the plastic part. Now heat the lower part of the brass tube, where the PL socket is. Try to turn it (unscrew) it carefully. If all solder has been remove at the other end the PCB inside should rotate with the PL socket and come unscrewed after a moment. The only way to check for proper function is to use the antenna. A small hint is the current intake, the amplifier requires 35mA @12V when functioning as specified. My experiences with this antenna on VHF and UHF are good, considered that this is a wideband antenna from 500kHz to 1500MHz. Any dedicated VHF or UHF or even dual band antenna will work better on these bands, but I need a wideband antenna for WFM, DAB+, DVB-T and so on, without the space for dedicated, narrow band antennas. So the D-707 is perfect for me, my DAB+ reception was never that good as with this active antenna. Next is a test of this antenna at 1090MHz for ADS-B reception. Have fun and good DX.